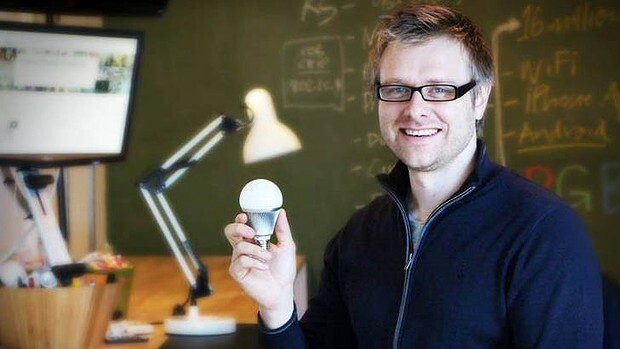 An Australian entrepreneur has developed a reimagined light bulb that can last for 25 years and be controlled by smartphone – and in two days he’s raised more than $600,000 on crowd-funding website Kickstarter to make it come to life. Phil Bosua of Ferny Creek in Melbourne, 38, a father of two, is the creator of LIFX, a Wi-Fi enabled, multi-colour, energy efficient LED light-bulb that you can control with your iPhone or Android smartphone. LIFX can not only be turned on and off using a smartphone, but can also have its colour and brightness changed. It can also be programmed to be turned on at certain times and can even be set to match the beat of a song, as well as react to notifications on a smartphone like those from Twitter and Facebook and flash a certain colour. Phil Bosua, inventor and co-founder of LIFX. Speaking with Fairfax Media from New York, where Bosua is “learning how entrepreneurship works in America”, he said the idea to re-invent the light-bulb came to him about six months ago when a friend relayed a frustration to him concerning renovating. “Basically a friend of mine was sort of saying that they wished that they could have a wireless [light-bulb] switch in their home because they were renovating and didn’t want to cut up their brick wall to run a wire down it,” Bosua said. “And he basically asked me [what I could do about it], because he sort of knew that I was the inventive type. 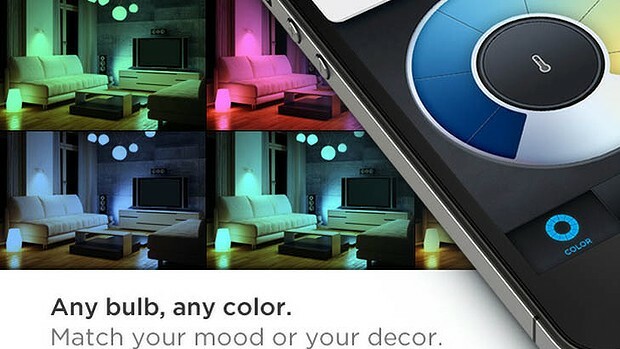 LIFX allows you to match your lighting with your mood. He said LIFX light-bulbs can last up to 25 years and used up to 50 to 80 per cent less energy than light-bulbs currently used by many households and said this was one of the reasons why he wanted to get his project off the ground, as he thought that current light-bulbs “didn’t represent the smart culture of our day and our eco-aware sensibilities”. But he never expected the project, which began as a weekend hobby, to reach more than $500,000 on its second day of crowd-funding, surpassing the $100,000 goal he set on it (just over $500,000 was pledged this morning and by this afternoon it had reached $600,000). The minimum pledge, which more than 900 backers have chosen, costs $US69 and gets the backers one LIFX light-bulb, which includes shipping to Australia, Canada or the US. “Wow. That was my first reaction,” Bosua said when seeing how much had been pledged by the more than 3900 backers on the Kickstarter website as of this morning. 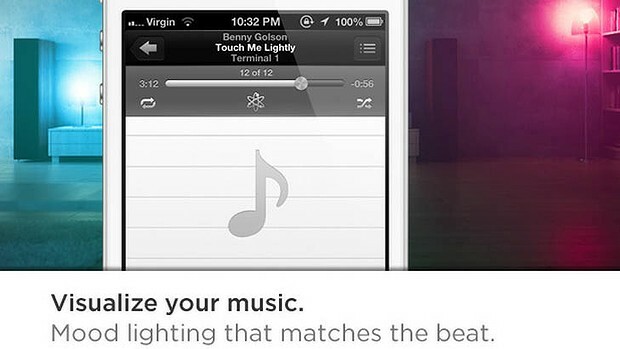 You can also visualise your music using LIFX. “I’m glad that this project resonated with people as much as it resonated with me,” he said. As well as working on his project to re-invent the light-bulb, which now has six co-founders, Bosua runs a successful iPhone and iPad app-making business called LimeMouse and is also working on a project called RefreshHQ to make brand’s Facebook feeds more engaging. He’s also been involved in two other Kickstarter projects, one of which raised $184,499 earlier this year to build a portable scanning box that uses a smartphone’s camera to take high-quality scans. He said one of the most successful apps he had developed through LimeMouse was a Gray’s Anatomy e-book designed for people like medical students or others interested in the human body. 1:51pm | Steve Jobs had no formal schooling in engineering, yet he’s listed as the inventor or co-inventor on more than 200 US patents. Joint co-founder of Apple retires as CEO of the mighty conglomerate which he drove to the top of the IT world. Science (May 22, 2009) — If you own a computer, chances are you have experienced the aftermath of a nasty virus at some point. In contrast, there have been no major outbreaks of mobile phone viral infection, despite the fact that over 80 percent of Americans now use these devices. A team headed by Albert-Laszlo Barabasi, director of the Center for Complex Network Research at Northeastern University, set out to explain why this is true. The researchers used calling and mobility data from over six million anonymous mobile phone users to create a comprehensive picture of the threat mobile phone viruses pose to users. The results of this study, published in the May 22 issue of Science, indicate that a highly fragmented market share has effectively hindered outbreaks thus far. Further, their work predicts that viruses will pose a serious threat once a single mobile operating system’s market share grows sufficiently large. This event may not be far off, given the 150 percent annual growth rate of smart phones. This study builds upon earlier research by the same group, which used mobile phone data to create a predictive model of human mobility patterns. The current work used this model to simulate Bluetooth virus infection scenarios, finding that Bluetooth viruses will eventually infect all susceptible handsets, but the rate is slow, being limited by human behavioral patterns. This characteristic suggests there should be sufficient time to deploy countermeasures such as antiviral software to prevent major Bluetooth outbreaks. In contrast, spread of MMS viruses is not restricted by human behavioral patterns, however spread of these types of viruses are constrained because the number of susceptible devices is currently much smaller. As our world becomes increasingly connected we face unprecedented challenges. Studies such as this one, categorized as computational social science, are necessary to understand group behavior and organization, assess potential threats, and develop solutions to the issues faced by our ever-changing society. Intel’s chief technology officer Justin Rattner characterized the research prototype as a breakthrough in research as copper wires were reaching their limit. There is a wealth of data that needs to be moved, and transferring data at 10G bps or more over copper wires is becoming a challenge. Even if the data could be transferred over copper wires at that speed, there are distance trade-offs. “Photonics gives us the ability to move those mass quantities of data across the room… in a cost-effective matter,” Rattner said. The technology won’t be implemented at the integrated circuit level in the short term, but could replace copper wires that connect CPU to memory, for example, said Mario Paniccia, an Intel fellow. The optical interconnect will reduce latency, which could result in faster data movement and processing. “We think it’s going to be perfectly at home in data-center applications,” Rattner said. For consumer applications, an optical interconnect would also help users to down movies to handheld devices at faster rates, Rattner said. “Once we’re confident we have a high-volume manufacturing capability, then we’ll turn to the business question: what market opportunities are attractive to Intel?” Rattner asked. Before you proudly go posting photos of your Ming vase online, you should be aware that computer-savvy burglars can likely use that photo to find out where you live. The same goes for photos or videos of your kids, yourself, or anything else that you don’t want strangers knowing how to locate. The practice of tracking people via their posted images is an example of “cybercasing”, and is possible because many digital cameras and smart phones, including the iPhone, automatically geotag their images by embedding the longitude and latitude at which they were taken. Even when uploaded to a website, the images still retain this information. By plugging the coordinates into a service like Google Street View, getting an address or an identifying landmark is entirely possible. This disturbing fact was recently announced in a report published by the International Computer Science Institute (ICSI). Researchers Gerald Friedland and Robin Sommer wrote that they successfully obtained the home addresses of people who had posted photos in ads on Craigslist, despite those people having opted to keep their addresses hidden in their postings. Creepier still, they were also able to obtain addresses where home videos of children had been shot, by searching under the tag “kids” on YouTube. They then proceeded to search for recent videos from those same users, that had been shot over 1,000 miles away. Within 15 minutes, they were able to determine that 13 of these video posters were likely still away on vacation, leaving their homes available for burglary. While iPhones do geotag by default, it is possible to turn the feature off. The folks over at I Can Stalk U (they’re against stalking, not in favor of it) can show you how. For other phones and cameras, a Googling or a look through your user’s manual should tell you what you need to know. The new OSLUX from OSRAM Opto Semiconductors is brighter and smaller than ever before and provides extremely uniform light thanks to a chip fabricated in state-of-the-art UX:3 technology. Together with an optimized lens it not only ensures that the LED is 50 percent brighter than the predecessor model but also that the light is much more evenly distributed and can therefore illuminate a wide area. The new OSLUX has an area of 3.9 mm² and a height of only 2.5 mm (previously 3 mm) but is 50 lx brighter. This takes its output to an impressive 150 lx. The light is uniformly distributed in the flash; the usual round spot in the center is completely absent. “Our OSLUX is therefore perfect for the fast-growing design-based smartphone and cell phone segment”, said Gunnar Klick, Marketing Manager Consumer at OSRAM Opto Semiconductors. “Even extremely thin phones can now be equipped with a powerful LED flash so they can deliver pictures of superb quality”. The LED is available in two versions with different lenses. These are already integrated in the LED and are matched to the beam characteristics of the top-emitting UX:3 chips. The subject of the picture is illuminated in a uniform rectangular pattern. The distribution of the light depends on the lens used: 40% or 20% of the center brightness is possible in the corners. At a distance of one meter the LED flash uniformly illuminates a diagonal of 90 cm, which is sufficient to produce razor-sharp pictures even in low light conditions. The impressive brightness is the result of new UX:3 chip technology that makes the LED capable of handling high currents and gets even more light from the chip. What’s more, the light is more evenly distributed over the surface compared to previous chip technologies. The new OSLUX is therefore considerably more efficient at high currents than previous LEDs and offers impressive luminous efficacy in a small area. With the new OSLUX OSRAM’s LED portfolio for flash applications is even better tailored to the latest trends in which mobile slimline terminals require small powerful light sources. For users who want to supply their own lens packages there is the CERAMOS which has no lens.